Yes, you have heard that regular exercise is important. Yes, you know that you should probably be doing more of it. Exercise is much more than working up a sweat; when done properly it can change the function and structure of the human body. The human body is extremely efficient at conserving energy. The more often you perform a certain exercise with the same amount of weight or run the same distance, the more efficient your body will become at performing that work, and you could experience a reduced training effect. The effects of the aging process can greatly diminish the mechanical, metabolic, hormonal, and neural systems that help our muscles control movement. Smarter Workouts delivers effective workouts designed around a single piece of equipment. From mobility to core strength to metabolic conditioning, you’ll learn how to create workouts for your goal, your schedule, and the equipment you have access to. What are the biggest obstacles to sticking to a workout plan? You don’t have enough time? It costs too much? You don’t have enough equipment? You don’t know how to get the results you want? Now you can set those excuses aside. 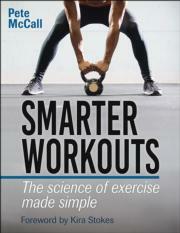 Smarter Workouts: The Science of Exercise Made Simple gives you the solution you need with efficient and effective workout programs that use only one piece of equipment. You can work out in a short period of time without spending a lot of money on expensive equipment or gym memberships—all while targeting your personal goals. Armed with a variety of exercises and organized plans, you’ll flow quickly through your workouts, saving precious time and experiencing real results. Put an end to your frustration and let Smarter Workouts be your go-to guide for smart, effective workouts. CE exam available! For certified professionals, a companion continuing education exam can be completed after reading this book. The Smarter Workouts Online CE Exam may be purchased separately or as part of Smarter Workouts With CE Exam, apackage that includes both the book and the exam.